Read the Athletics Sustainability Report to learn about sustainability initiatives from Carolina Athletics, campus departments, and community partners to green game days. RAMESES RECYCLES is an integral part of Carolina Athletics’ commitment to sustainability and waste reduction on game days. At the 2011 Carolina Recycling Association Conference, Rameses Recycles won a Spotlight Award for its participation in the EPA-sponsored Game Day Challenge. Read about the partnership between UNC Athletics and REPREVE and the #TurnItGreen basketball game vs. Boston College on Jan. 30. Recycling is part of the fun on game day! Coca-Cola, sponsor of the Rameses Recycles program, provides recycling bins for Tar Heel Town. Rameses Recycles is an integral part of Carolina Athletics’ commitment to sustainability and waste reduction on game days. In the 2010 football season, UNC recycled over 16 tons of bottles, cans, and cardboard from Kenan Stadium and the tailgating lots. Rameses Recycles volunteers, primarily Sport Club athletes raising funds for their teams, visit each tailgating lot and hand out free color-coded bags for recycling and trash. The green bags are for recyclables (bottles and cans only) and the black bags are for trash. If you are in a parking deck, then you may leave the closed bags at the designated Recycling End Zone. If you are tailgating in an open air parking lot, then simply place the bags in the nearest blue cart or leave the closed bags at your parking spot. Bottles, cans, and blue cups are all recyclable. Inside the stadium you will find recycling bins next to the trash cans on the main walkways. Behind the scenes, lemonade stands and other concessions booths compost their preparatory and leftover food waste. Rameses Recycles was the focus of an Environmental Capstone team in the spring of 2010. View the Final Recommendations, Final Report, Final Presentation and Final Report Appendix of this semester-long project. Recycling at your tailgate? Then you’re eligible to be the Coca-Cola Recycle & Win Fan of the Week! 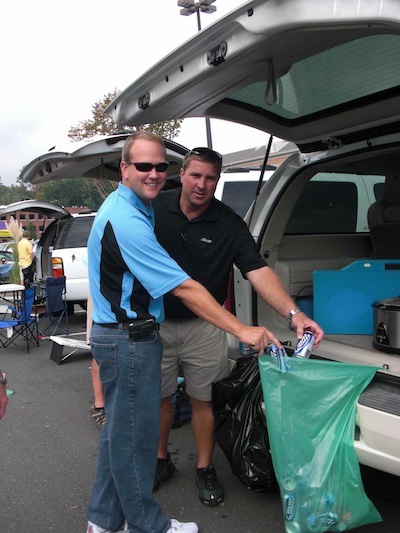 Use the green bag, distributed by UNC Sports Club athletes in the parking lots, to recycle bottles and cans at your tailgate. If you’re found recycling correctly, you could win a $100 Harris Teeter gift card! Subject to the official rules. UNC Sport Clubs athletes volunteer distributing color-coded recycling and trash bags. By volunteering with Rameses Recycles through the Sport Clubs Community Service Incentive Program, student-athletes increase service participation and volunteer efforts in the local community, increase awareness about service organizations and opportunities, and assist their teams with their fund raising efforts. Contact the Office of Waste Reduction and Recycling at 919-962-1442 or recycling@fac.unc.edu if you or your student organization are interested in supporting the program. The Office of Waste Reduction and Recycling, in partnership with Carolina Athletics, values environmental stewardship as a part of every game day experience. The tailgate recycling program began with an APPLES course in the fall of 2008. Surveys were taken before the home game against Georgia, with fans overwhelmingly responded with demands for recycling availability before, during, and after the game. This process proved quite effective as 0.68 tons of recyclable materials were collected from the pilot program, more than that year’s student Fall Fest! In 2009, more than 16 tons of recyclable waste was diverted from landfills during Tar Heel football games. About 5 tons of the total recyclable material came from tailgating. The color-coded bag system additionally decreased the amount of litter at tailgating sites and made post-game clean-up easier. In 2009, the switch to green bags for recyclables enforced the message that Carolina Football is going green. In the spring of 2010, the program took the name Rameses Recycles. A follow-up survey demonstrated that the demand for football recycling had not been met. Using the color-coded bag distribution system, volunteers will visit the following sites: Bowles Lot, Stadium Drive, Craige Deck, ACC Lot, Ram’s Deck, S11 Lot, Dogwood Deck, and Cardinal Deck among others. In the fall of 2010, Sport Clubs partnered with Rameses Recycles through its community incentive program. Athletes hand out the color-coded bags in the tailgate lots and decks. Additionally, UNC competed in the EPA-sponsored Game Day Challenge on October 30, 2010. UNC was able to divert 39% of its waste from the landfill and ranked 20th overall for diversion rate. Concessionaires and the Chancellor’s Box began their compost programs through the competition. To learn more about the Game Day Challenge and see results, visit WasteWise. 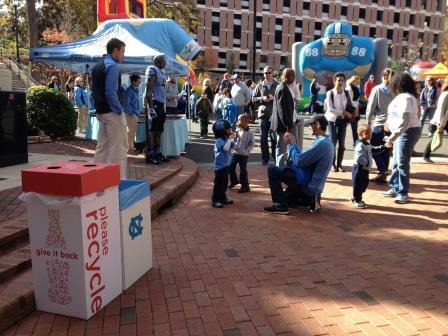 UNC-CH received a Carolina Recycling Association Award for its achievement in the Game Day Challenge. The following steps demonstrate the minimum needed to create and sustain an appropriate waste reduction strategy for campus athletic venues. These venues include the Dean E. Smith Center, Kenan Stadium, Boshamar Stadium, Carmichael Auditorium, Cone-Kenfield Tennis Center, Fetzer Field, Koury Natatorium, Francis E. Henry Stadium, Anderson Softball Stadium, UNC Boathouse at University Lake, and Chapman Center. Offer recycling bins both inside the venue and by the entrances and exits for use by the attendees. Pair trashcans with a recycling bin. Every recycling bin must have a trash can next to it. And ideally, every trash can has a recycling bin next to it. Keep recycling bins clean and clearly labeled to encourage fans to recycle and avoid contamination of the recycling. Initiate and sustain recycling programs for game-related events, such as tailgating, media rooms, box seats, etc. Make sure that recycling bins are emptied to appropriate collection areas for recycling and not mistaken for trash. When applicable, the post-consumer trash and recyclables from seating areas should be separated and disposed accordingly during post-game clean-up. Vendors must separate and collect their recyclables—for example, break down and collect cardboard boxes for proper recycling. Encourage the use of recyclable and reusable materials from concession vendors. Make sure employees are aware of program and ensure that collection, monitoring, cleaning and maintenance of bins are incorporated into routine operations. Educate fans and endorse recycling opportunities through traditional and new media in conjunction with athletic promotion. Recycling bins, public announcements, and signs should publicize recycling instructions, facts, and statistics. Set a policy that reflects Carolina’s commitment to waste reduction and share with stakeholders and the community. Waste tracking data must be collected and reported. Achievements should be publicized to fans, staff, and stakeholders. When possible, conduct routine waste assessments to evaluate program effectiveness. Maintain an athletic waste reduction program surpassing those of comparable institutions. Explore the feasibility of a compost program, starting with pre-consumer (“back of the house”) operations with vendor support. Athletic Venue Recycling Guidelines (printable version).